Today I leave on a road trip from New Hampshire to Virginia to pick up a friend, to Chicago to pick up another friend, and then all the way out west across the country to Idaho. We’re going for a friend’s wedding. But I’m going because that’s where my life began. For the first time since I was 2 years old I’ll be back in the place where I was born, I’ll see the places I grew up. Maybe my memory will be jogged. Maybe not – 2 is pretty young. This is the kind of adventure I can’t turn down. I get to road trip all the way across the US and see so many sights. We’ll be stopping to see the major must-see places like Yellowstone and Rushmore, but for me its as much for the trip itself as for the views. We’ll be cliff jumping in Coeur d’Alene as well. This is the last of my (many!) summer road trips. I’ll be glad to not be on the road once it’s done but I cannot wait for it to get started. I’ll have my two companions on the way out there but I’ll be alone the whole way back, so I’m anticipating some solo camping and some unplanned adventures of my own! So, wish me luck on my last trip – I’m sure I’ll have some stories on the other side of the weekend! That’s a long way, take care. Very jealous! 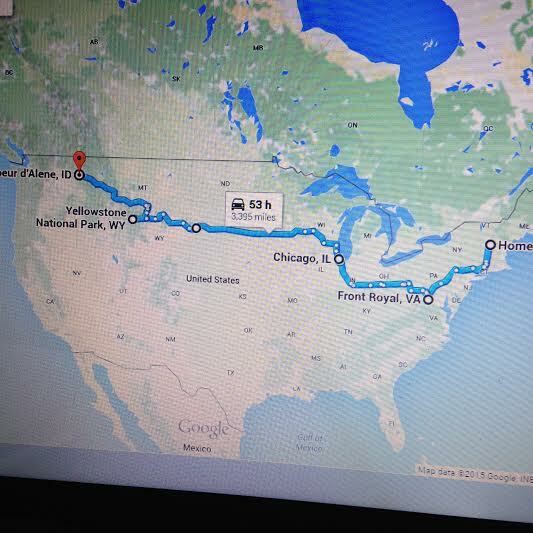 Doing a US coast to coast drive is on my bucket list! Enjoy, safe travels and take lots of photos!